I hope everyone had a wonderful weekend. I spent time remembering all the family members on both sides of the families who served in the military down to and including both myself (oldest) and my brother (youngest). I had uncles on both Mom's and Dad's side that served if only their 3 or 4 years, and then I also had other uncles that went to be "Lifers" as the military calls them. My husband's father also served his time in the military. stationed at Aberdeen Proving Grounds, Maryland. While we were stationed in Okinawa, in the mid 80's the Statue of Liberty was having a birthday of sorts. 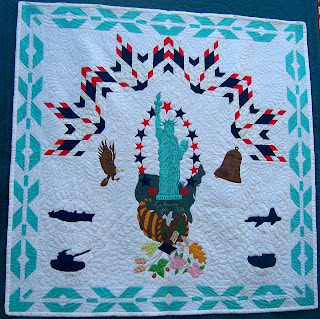 A museum in NYC, had a quilting contest in celebration. I designed my quilt to include the branches of the military on Okinawa and also used a design to represent the Native American hertiage we both have and also for those who served in the military. into the 52 finalist - that were the final winners. But I consider myself very fortunate, to be in the semi-finalist group. 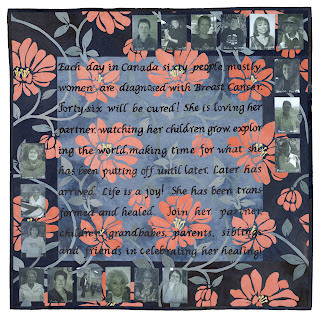 The quilt also serves as rembernace for all our family members who ere in the military. I promised that there would be abig announcement before the 1st of June, well, here it is!!!
" F A B R I C P A R T Y "
on the sign and read all about the detials. celebrateation of her anniversary, Benita is offering a free membership (valued at $22.50) to her site. For a chance to win this free membership, enter a comment for this post and your name will be entered in a drawing to be held next week on June 1, the 1st day of Benita's celebratation!!!!!! 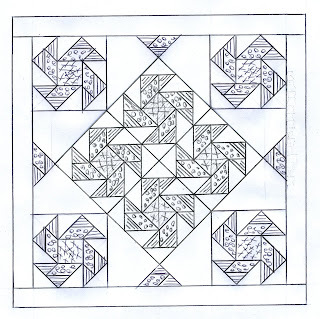 Since my granddaughter likes drawing names so much, she gets to draw one name and I will contact that quilter for her name and address and pass it on to Benita so that she can register her for the membership. Best wishes on winning the free membership! 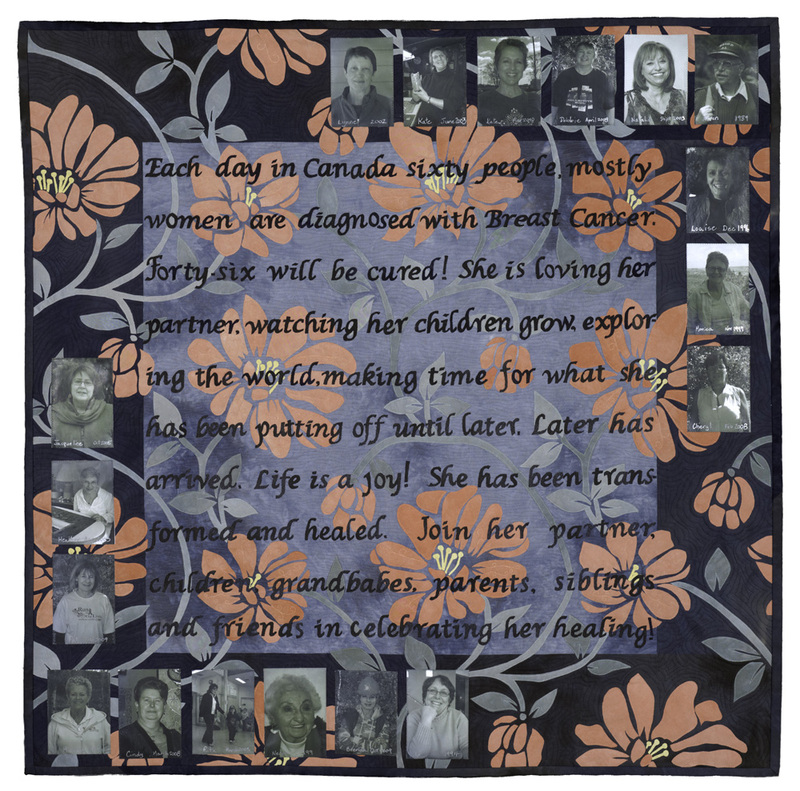 In the years since I joined the "QuiltArt" list ( www.quiltart.com ) there have been a whole lot of time and energy put into raising funds and awareness about all types of Cancers. And there was always a large turn out of participates to make things and help raise money the best way we know how - - making Quilted items . 100 Block follow-up & Life !!!! I can't believe it has been almost 2 weeks since I was able to create a new post. But Life does have a way of getting in the way. We have had rain often enough that I couldn't get out on the deck to get the photos taken. I was finally able to cut the grass and get the phots taken today. Here are photos of two wall hanging tops - not quilted yet. 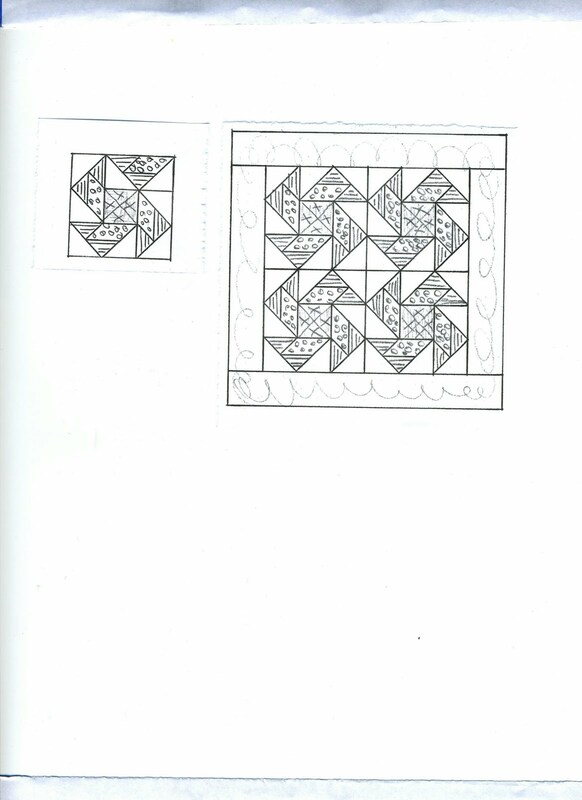 The 1st one is of the block that was in the magazine and the 2nd one is a varation. I know there are a lot of triangles, but it is worth it once you have the blocks made. My granddaughter just gushed over it while she was helping me take the photos. One thing y'all will notice, is that I like green!!! Here is the second wall hanging, and you will notice that I made a varation to this one. But in fact this is the orginial block I started with and wasn't happy with it. So I started playing with it and when I created another triangle, that is when the block popped !!!! Some may like this version better and that is OK. You also can put both blocks together into the same piece and see what you come up with. BUT, for those who make this block, please send me some photos of your finished piece. I Hope all had a very enjoyable and nice Mother's Day yesterday. I did, my husband fixed dinner and I got flowers and a cord. The ut flowers are not lasting as long as they used too. And I now see why, most of our mothers wanted flower plants instaed of cut flowers. I am beginning to feel that way also. And I was and still am a little sad from yesterday. of us before she passed away. They say it gets earsier, but you never forget. And the Winner is !!!!!!!!!!!!! 2011 | Quilty Pleasures Blog . And as they say all good things must come to and end. 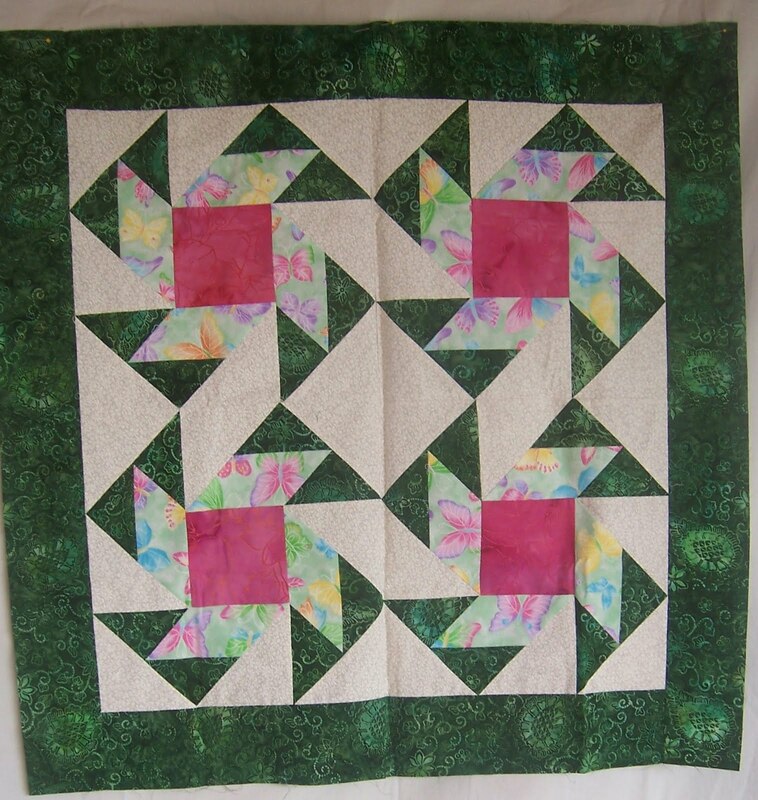 But hopefully y'all will visite the pages of blogs on the Quiltmaker's blog all year. Each and every block is wonderul and there are blocks for all levels of quilts. And just think of the sampler quilts that can be made.!!!! And for those of y'all who are waiting to get your hand on a copy of the magazine, it will be out in the bookstores and newsstands on May 10, 2011. But in the meantime, on my blog, my 11 year old granddaugther, drew a name this morning on her way out the door to school. TA DAAAAA !!!! and the Winner of the prize copy from my blog is !!!!! Cathy B, from Michigan. 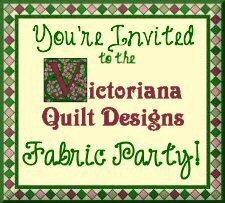 I hope you enjoy the magazine and I would love to see any and all quilted items made using my block, from anyone who viisted my blog . I didn't know where Cathy was from until she answered my email. But our oldest daughter and grandaughters live in Flint, MI. if you want to use this layout that is fine too. for what ever reason, I could not get my photo to upload on the post, so I am trying again. Half way to Firday !!! I missed posting yesterday. It was one of those days when one thing goes wrong it seems like everything does. I didn't have time to even check email Tuesday morning and by the time I got home, it was time to fix dinner and do all those other home things that we all know have to be done. 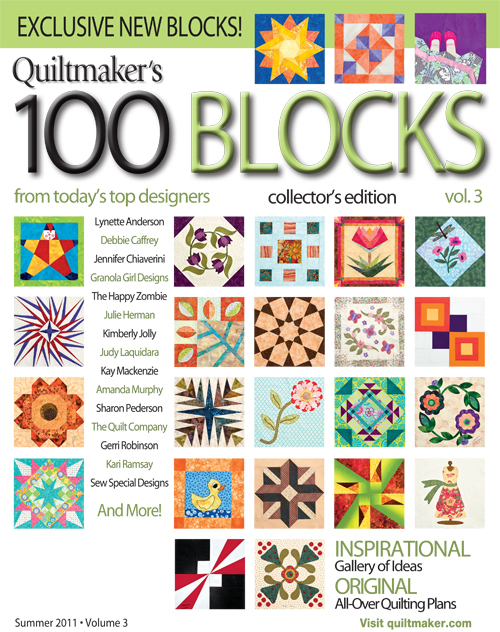 But I do hope that everyone is enjoying the Quiltmaker's 100 Blog Tour, the designers in each magazine keep setting the bar higher for designs. By the way, I should let you know that this is my 1st blog tour but this is the second Quiltmaker's 100 Blocks magazine, that I have a block in. If you have Vol # 2, then look for my Dragonfly block. As soon as I can get some pictures taken ( it's been raining here in Northern Virginia), I will take a picture of my Dragonfly block and also the quilt top that started the Dragonfly. I love doing piecing, applique and designing artquilts and patterns. But I will take suggestions as to what y'all would like to see me write about. After this week , I think I will start with the pieces I have made for some of my internet buddies who have books out there. But in the meantime, I will leave you will this one picture of my work (hate to just read and no pictures, VBG) I think I will show y'all my Maryland quilt. Quiltmaker's 100 Block Tour Today !!!! When I 1st woke up this morning, I wanted to rush to the computer and check out my blog and Quiltmake's Blog Tour page, but I made myself wait. I had to get my granddaughter off to school, she's in the 5th grade and follow my routine. I can also see that blogging is going to be addictive, at least at 1st. Plus, I do need to learn more about post pictures and tweeking my blog page. But imagaine my surprise when I went to the " Quiltmaker's 100 Blocks Blog Tour ": and the 1st block that popped up was mine- - # 296 !!!!!! 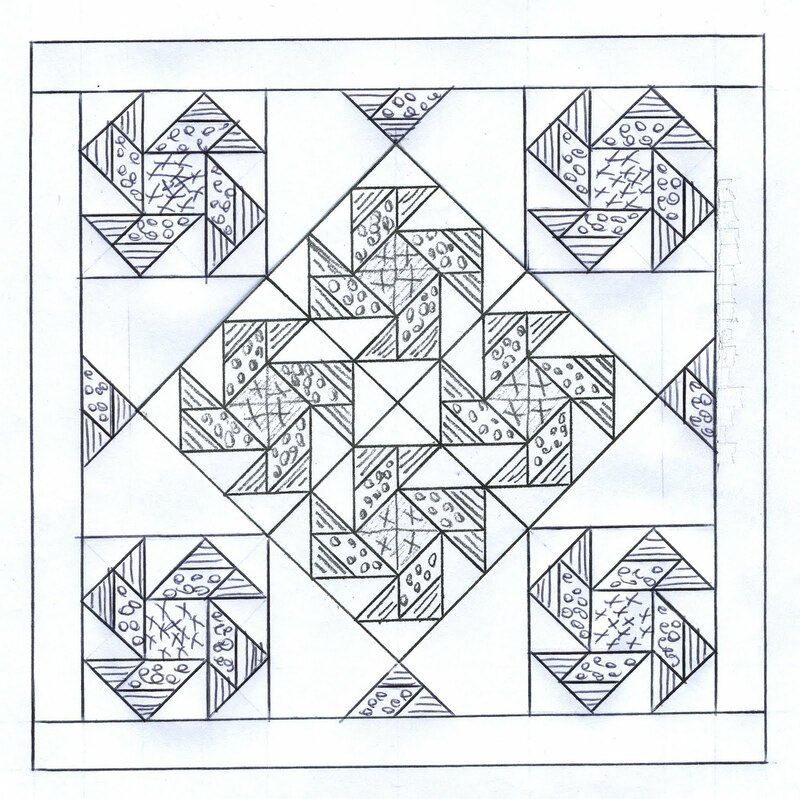 Like I mentioned in the post, earlier this morning, the rough line drawing of my block and wall hanging layout, is not so hot, but for my 1st attempt at putting something like that on a blog, I feel I did good !!!! But I will take some picutres this week of the block in another color set and a picture of the wall hanging. And I want to thank those who have already commented on my block and blog and everyone who has commented today, their names go into a hat for my granddaughter to pull a name from. And that lucky person will get the copy of the Quiltmaker's 100 Block Vol # 3. Nothing like trying to learn something new at the very last minute, but life does get in the way most of the time. I am proud to have a block in this vol # 3 of the magazine. I am on the list for the blog tour for Monday, May 2, 2011. 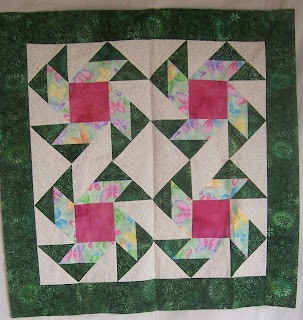 Quiltmaker's Blog has a complete list of everyone who is participating in the blog hop. Quiltmaker | Quiltmaker - - http://www.quiltmaker.com/index.html and the blogs of others in the blog hop. 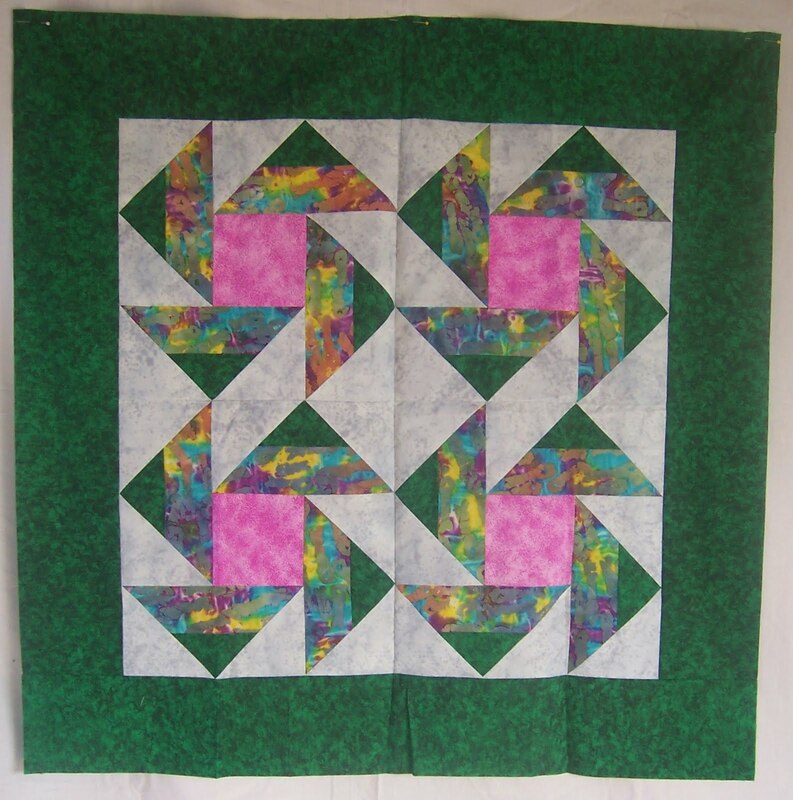 Here is the cover - - - Join me for the Quiltmaker's 100 Block Blog tour May 2-6, 2011. My block is called "Around the Block. It is an optional illusion block once you start putting the blocks together. I hope you will have fun with it. 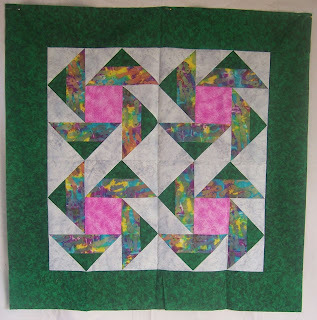 Want to win a ccopy of the Quiltmaker's !00 Blocks ??? Just leave a comment on this post to be entered !!! 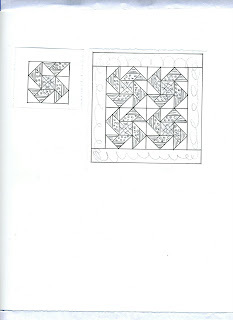 ARound the block square and a wall hanging layout. Directions for piecing the square will be found in the magazine. Please excuse the ruffness of this post, as I am learning how to do all of this, a new blog, posting to the blog and also the hardest thing was figureout out how to get phots onto the blog. I promise I will get better at this.